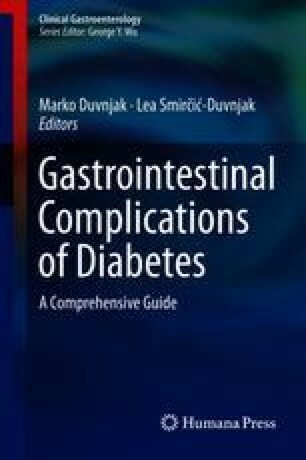 Treatment of enteropathy in diabetics is demanding, and should focus on both prevention of diabetic gastrointestinal complications and treatment. Up to now, most of the available treatment has been focused on symptom relief, while the preventive strategies are mostly still undergoing research. The most important factor in treatment and prevention of this condition remains a proper level of glycemic control. Several preventive strategies or preventive approaches have been considered and investigated in recent years, such as improvement of nutritional and psychological status, but with no final conclusion. Some new drugs and therapeutic approaches have also emerged recently, with the potential for improving motility or other diabetes-related gastrointestinal symptoms. As celiac disease, like autoimmune enteropathy, occurs in patients with T1D with significantly higher prevalence than in the general population, screening and treatment in diabetics is recommended. The only effective therapy for celiac disease is a life-long gluten-free diet. The combination of gluten-free diet and diabetic diet is sometimes very complicated, and extensive support by a dietitian is mandatory.